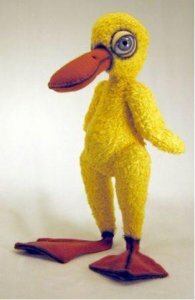 Myron is a 13” tall duck made of rayon and wool felt. He is fully jointed with wire armature in his legs, web feet and wings. He has airbrushed enhanced facial features with large blue glass eyes. Myron is one of three creations Art Rogers created for his first attendance at the WDW EPCOT Bear and Doll Convention. Limited Edition convention pin included. Tag signed by Art and button attached to Myron.